Leon, James, Josh, Sean and Ready-Up’s Dan Bendon return to review Square Enix’ late summer 2011 smash, Deus Ex: Human Revolution. Did Eidos Montreal’s prequel do justice to the legacy of Ion Storm’s seminal 2000 original and justify those stellar scores, or was it a case of “right place, right time” for a game which wasn’t even fit to lace the cybernetic-ally enhanced boots of disappointing 2003 sequel Invisible War? So I completely forgot to mention my run in with Adam Jensen. Hey, Neil (Taylor). 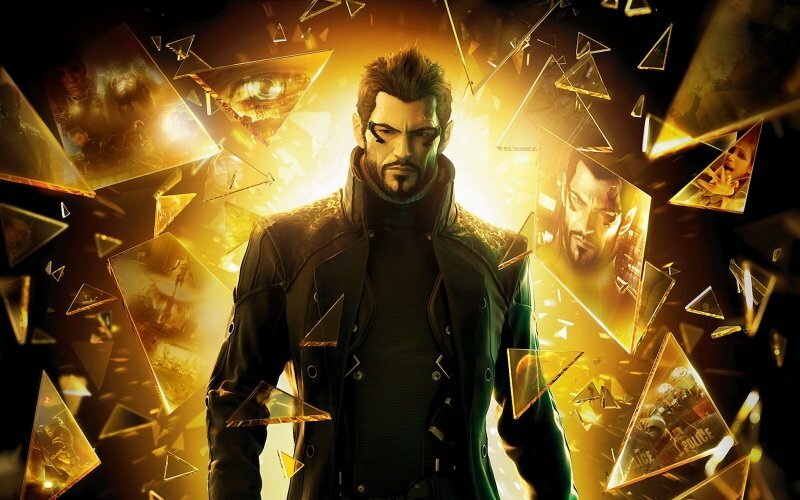 You might want to avoid Deus Ex: Human Revolution – it’s got BATMAN VOICE! Yeah, I sure wouldn’t want to have been the one emptying Elias Toufexis’ phlegm bucket. Impressive! I nearly coughed up a lung imitating Jensen. Also, please don’t hunt me down. For anyone confused, Neil Taylor doesn’t like “BATMAN VOICE”, Elias Toufexis is the voice actor behind Adam Jensen’s gravelly drawl and I am still waiting to be taken out… lethally. Thankfully it seems Elias has a sense of humour when it comes to such matters, but also a predilection for searching for his own name on Twitter (um?). The alternative is that he’s employing an A.I. as an all-seeing eye across the Internet. What was that?…. Who’s there? Superb. Well I hope he doesn’t tune in to this podcast as I was even more unkind about Jensen’s voice. I’m sure Elias is a fine actor but I just don’t dig that Snake Plissken schtick any more. Surprised that there was no mention of “The Missing link” DLC. I found it to be surprisingly good. One of the best DLC packages i’ve played this year in fact. Apologies for that Mark but I guess that as this was originally part of the same recording as the Bastion show and made prior to the decision to split the show into two separate issues, there was the slight problem that we had already gone way beyond our self-imposed time limit and so felt the need to keep it contained to just the initial release of the game. Most if not all of the panel had deliberately ignored The Missing Link dlc as we each felt it was redundant in that the narrative would not be enhanced in any way by filling in that arbitrary ‘gap’ in the story. Yep, exactly as Leon said; I think “The Missing Link” was discussed after the show was in the can, but none of us was compelled to try it out. I’ll probably take a look once it’s on sale on XBL. Expect my thoughts in article form at that time. hi, I gave you guys a go from Gonzo Planet, as they recommended you. Unfortionately I gave up at the 12 minute mark as the impression I get from you is that you are not very reflective of your critique. Now I may disagree with the cast of Gonzo but the reason they are my favorite podcast is that even if our opinion differs, their reasons behind them are so well thought out and iron-clad that I Highly enjoy listening to them. From what I heard you have mostly given unconstructive complaints without giving any reason for me to sympthatise. If one were to be rude, One could have the opinion that “These guys are just a couple of old gaffers sitting around complaining”. Now I dont want to think that, since you guys seem to be very smart. I am assuming I just need to listen to another podcast to get a better impression. Could you direct me to another episode? Thanks for the feedback. However, can you give us a specific example in regards to our “unconstructive complaints”? I would actually quite strongly disagree with such a seemingly off the cuff remark mainly due to the fact that you a.) only listened to twelve minutes of a seventy minute podcast and b.) don’t appear to have listened to any of our other shows. My suggestion would be to go and listen to some of the other stuff we’ve done before jumping to the somewhat ridiculous conclusion that we’re “just a couple of old gaffers sitting around complaining” – I’m not going to point you towards any one particular episode – I’ll leave you to think for yourself on that one. If you do this and still don’t like what we do, well, let’s be honest, there’s no shortage of other game-related podcasts out there for you to listen to instead is there. Hi Adam. You are of course entitled to your opinion, and it may well be that no matter how many of our shows you listen to you wouldn’t feel any differently. However the great majority of our reviews have been positive, particularly regarding our ability to critique games fairly and insightfully. Certainly over several years of podcasting I’ve been more often accused of being unreasonably positive about gaming than I have of being a grumpy old man type, so this is refreshing but atypical! The panel on this show featured three men in their twenties and two in their thirties so hardly, “A couple of old gaffers” Indeed two of those featured on this show are Josh and James, regular contributors to the excellent discourse on Digital Gonzo and that’s exactly what they have provided here on C&R over dozens of podcasts each. I haven’t listened to this show in months but I’m pretty sure we liked DE:HR quite a bit. I’d definitely recommend sticking around for more than twelve minutes but there’s no compunction of course. I said that one Could get that impression. . .never that I held it myself. As I also said I wont judge you until I have had a better listen to your material, which I have, in “ghost trick”. Which I found to be highly enjoyable.